We have emerged as a prominent manufacturer and supplier of a quality-approved range of Heat Resistant Shoes. - Full Grain Textured Leather Upper. 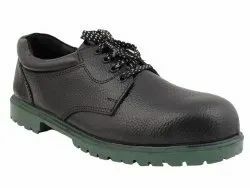 We are one of the leading Manufacturer, Exporter & Supplier of Aluminised Safety Shoes. Comprehending the varied desires of our clients, we are instrumental in presenting a comprehensive range of Heat Resistant Safety Shoe. 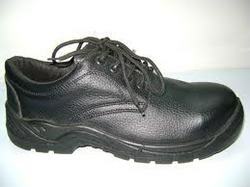 We are involved in offering the wide range of Heat Resistant Safety Shoes. It is available in various sizes and is used in diverse industries. The shoes laces are thick and additional safety layers are molded in it. It is available at the market leading price. - Ankle type heat resistance safety shoes. - Made out of buff zugrain leather. - Nitrile sole – Green. - Temperature resistance more than 3000 deg. - Tested as per IS 15298. - High ankle shoes with full leather upper and excellent soft padding inside. - Four eyelets with closed / open Tongue. - Perfect grip and most comfortable to wear. - IS 5852 marked square steel toe cap. - DVP / PVC and Nitrile sole with anti-skid design. - Oil, Chemical and Heat Resistance sole. - Aluminised Shoes - Upper is made of Aluminised Fiber Glass / Aluminised Kevlar cloth which is very effective for radiant heat and metal molten splashes. - Wool and pure Chrome Leather linings are provided inside the shoes. - Stitched from Kevlar threads. - Soles are made of Leather, concealed toe caps are made of steel. - Size : 6 to 10. - Upper is made of Aluminised Fiber Glass / Aluminised Kevlar cloth which is very effective for radiant heat and metal molten splashes. - Concealed toe caps are made of IS 5852 steel with Heat and Oil resistance.